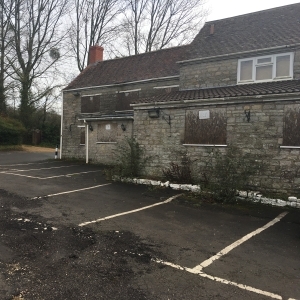 Mendip District Council: Darryl Howells has recently secured outline planning permission for the conversion of a former public house (Use Class A4) to a pair of semi-detached houses and the erection of a further five detached houses on the adjacent car park. The site is located in the countryside in a small hamlet south of Shepton Mallet. The details approved were access, appearance, layout and scale. The applicant instructed Simon Morgan of Morgan Design Studio, following initial discussions with Darryl, and his recommendation. Darryl co-ordinated the preparation of the plans with Simon, and then himself prepared the planning statement justifying the proposed development in policy terms. The Senior Planning Officer initially welcomed the scheme, however highlighted two key considerations that Darryl needed to address before the scheme could be supported – the loss of a community facility and lack of affordable housing. Darryl put forward robust arguments and evidence to respond to the issues, which the Senior Planning Officer fully accepted. The scheme was subsequently approved under delegated powers without any affordable housing provision. If you have a commercial building and are failing to achieve sufficient revenue from it, then please contact Pure Town Planning and allow us the opportunity to advise of alternative uses that could secure planning permission and the strategies needed to do so.